After several attempts to get the Parliament panel (composed of 11 MPs) to accept a petition that exposes the negligence of parliament to follow legal and constitutional rules on Brexit, the petition panel finally agreed to the Euratom petition. This exposes two major flaws in the Brexit process. Both Labour and Conservative governments when in office reneged their correct policy positions for a clear referendum on the EU treaty. 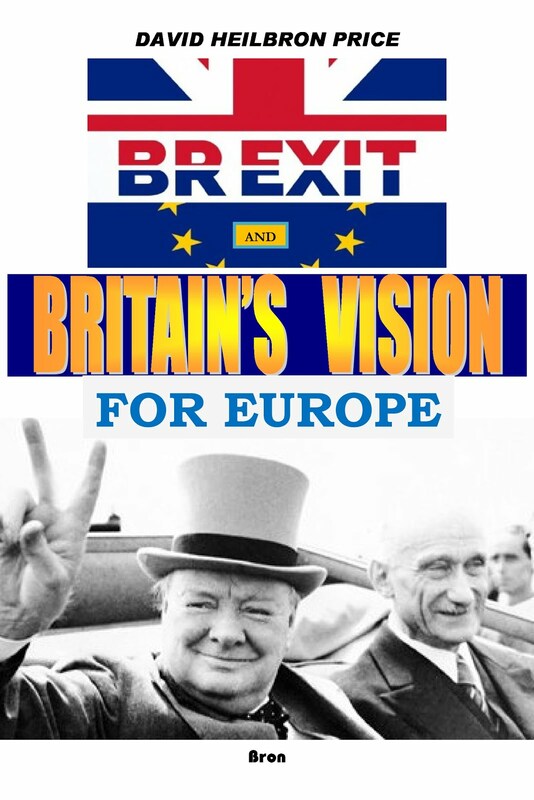 It emphasizes that the British people have a fundamental right to decide on the way Europe is being constructed. Up till now such decisions have been made behind the closed doors of the European Council. 1. In her Article 50 letter to Brussels Prime Minister May specifies that UK will leave Euratom. BUT the idea of leaving Euratom is not on the ballot paper of the Referendum. 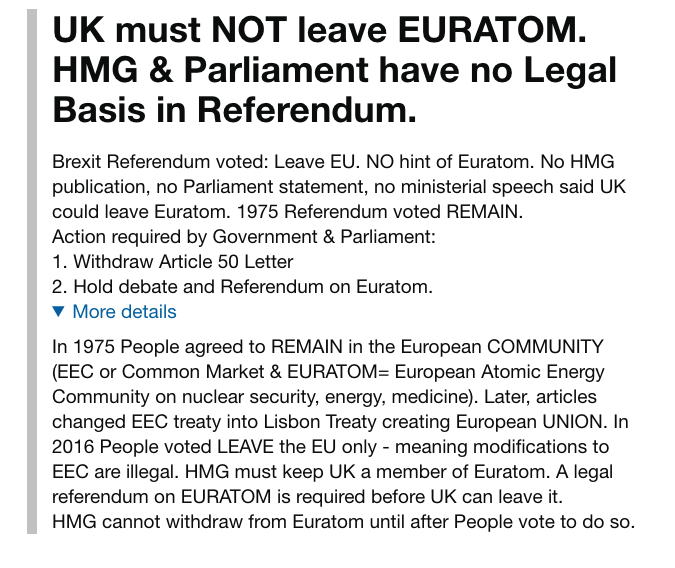 I have found no Government statement about Euratom before the referendum, nor speech in Parliament, nor any mention of Euratom in the publication they sent to all households. The Lisbon Treaty on the European Union and the Euratom treaty are quite separate in law. 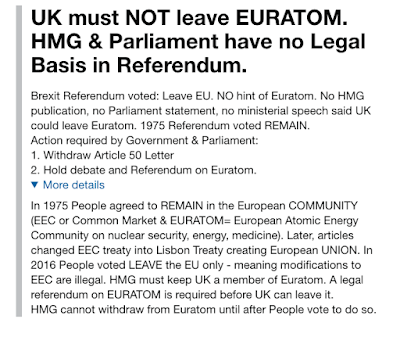 Euratom was signed in 1957 and British people voted to remain in it as part of the European Community in 1975. The Lisbon treaty is the last in a series of treaties that modified only one of two treaties signed in 1957 -- the European Economic Community treaty, known also as the Common Market. The EU system is vastly different from the original Community system. So leaving Euratom needs democratic approval by the people. 2. The second part of the petition is potentially even more important. The petition makes clear that the UK people only voted to leave the European Union. And that this is very different from the European Community and the original European Economic Community treaty. Hence all the additions and amendments that change the democracy of the original Economic Community treaty are declared illegal. These are the changes that, ever since the 1980s, people have ceaselessly complained about. They give the Community system "a democratic deficit". They include a whole series of closed door committees and bureaucracies. They involve a system that continues the Gaullist abuses of the Common Agricultural Policy (CAP). This subsidy to French farmers/ voters and others reached to nearly three quarters of the entire European budget. The UK objected. Agriculture represented only 2 or 3 percent of the economy. However despite the cuts to the CAP, the EU leaders found means to keep the budget at the same level of taxation! CAP still takes more than a third of the budget. And they are expecting a great budget increase in the coming years. Why? Where is the means to deal with the future, innovation and science? Why is youth unemployment so high and wages low? Many thanks for helping start this great debate about democracy in Europe. It is of historic proportions. Please feel free to circulate the link below from Parliament. Any British citizen worldwide and people resident in UK may sign up to the Petition. When it reaches 10,000 the government will respond formally. When it reaches 100,000 signatures it will be debated in Parliament.